Ranked as one of the top Kunming business and leisure hotels, Grand Park Kunming is located along the picturesque Green Lake Park. With Kunming’s most important commercial addresses within easy reach, the hotel is also a short drive away from some of the city’s world-class golf courses. Enjoy complete business efficiency, knowing that we can offer the right space for your meeting needs, along with the service and support that made us one of the top business hotels in Kunming. 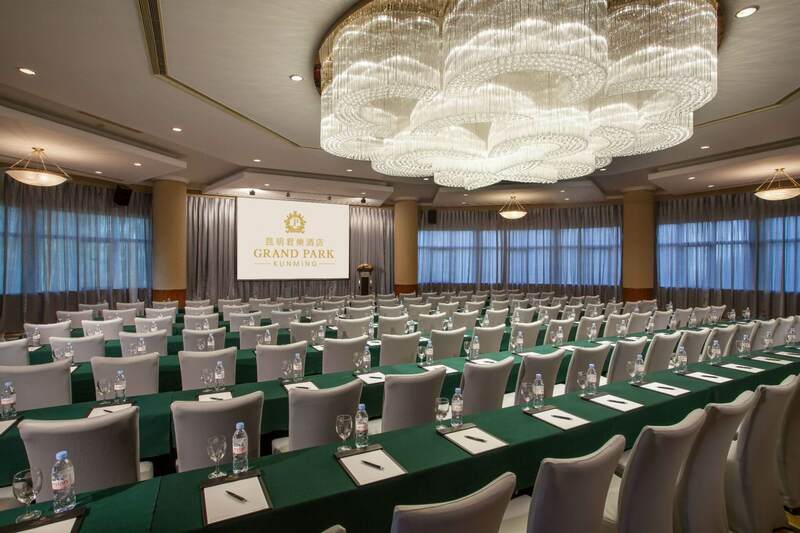 Designed to impress, Grand Park Kunming has more than 1,500 sqm of meeting and function facilities which include two majestic ballrooms and six flexible function rooms that can accommodate up to 380 people. The impressive Grand Ballroom, featuring a magnificent 2,200-crystal chandelier centrepiece is perfect for impactful corporate functions. The ballroom is adjacent to an expansive and exclusive foyer area ideal for pre-function cocktails. Be assured of a seamless meeting experience and leave the planning of your event to our dedicated meeting specialists. Holding your wedding at Grand Park Kunming will certainly be an event to remember. We believe in perfecting the little details that make up your big day. Grand Park Kunming offers distinctive wedding locations, reception venues and impeccable service for unforgettable celebrations, ranging from intimate to extravagant, traditional to unexpected, that are uniquely yours. Be spoilt for choice with our wide selection of cuisine from Western buffets to grand full-course exquisite Yunnan cuisine from Park Palace, or simply take pleasure in customising your own menu. As you embark on one of life’s most important journeys, let us be with you every step of the way. Leave the planning of your special day to our dedicated catering team who will take care of all your needs. Book your wedding banquet with us from RMB1388 only per table. Price is subject to 15% surcharge. To embark on your own Celebration of Love. Whether it is a lavish grand wedding, a corporate event party or an intimate banquet, Grand Park Kunming offers a truly unforgettable and hassle-free experience with event facilities that can accommodate up to 380 people. Panoramic views of the city’s famous Green Park and exquisitely appointed function rooms are key highlights, complemented by impeccable service delivered by a team that will go the extra mile.